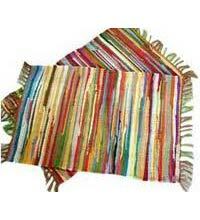 We bring forth a quality assortment of Multi Striped Chindi Rugs in the market. These Multi Striped Chindi Rugs are resistance to tear, have exquisite finish, high durability, smooth texture and gorgeous look. These Multi Striped Chindi Rugs are available in multiple strips designed from different colors. We offer these rugs at market leading prices.